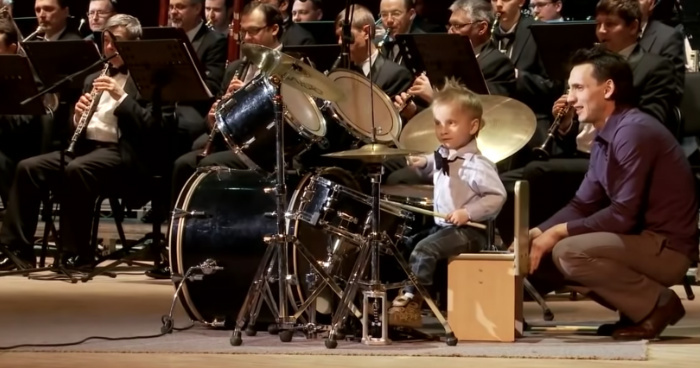 A three-year-old Russian drummer leads an orchestra of adult musicians through Offenbach’s Can-Can. Lyonya Shilovsky from Novosibirsk made his way into the spotlight earlier in 2018 when he appeared on the Russian talent show Minute of Fame. The kids below is leading an orchestra of adult musicians through a rousing section of Jacques Offenbach’s Orpheus in the Underworld, broadly known as the Can-Can. Without any paper in front, the boy memorizes all the crescendos, diminuendos and accompanying rhythms. The musicians were looking at him in amazement as Lyonya bashed the drums in a trance-like state. Finally, after giving an incredible drum session, Lyonya stands up to receive a bouquet of flowers and take a well-deserved bow. The mind-blowing performance took place at the New State Concert Hall of Arnold Katz in Novosibirsk.